I did not hear from the doctor last night, which is actually good. The nurse had said that if the news were “urgent” that he would call last night. If not, we would hear from him within 24 hours. Some of you have expressed anger about the way that the doctor’s office handled this. I’d like to ask you to reserve that for me. I can’t handle anger right now. I’m a little too busy with scared, and truthfully, I need these people. I need to feel okay about them. They hold the keys. So the night ended without answers. But as frustrating as that was, I went to bed knowing that I was not carrying this alone. That my girl was surrounded by the love and light and prayers of all of you. And the love and support became a tangible presence in my home. When I got the call from the nurse yesterday, I sat at my desk alone. I swallowed my panic and tried like hell to steady my shaking hands. And then I did something that I never would have done two years ago. I took a deep breath, and I asked for help. I said, “I can’t do this alone.” And as soon as I said it, I realized that I didn’t have to. Because I wasn’t alone. I never am, really. None of us – no matter how isolated we may feel at any given time, is ever really alone. So I told my closest friends. And my husband. And my parents. And I told you. And three hundred and forty of you – THREE HUNDRED AND FORTY – got together and set about knitting the blanket of comfort underneath which my family slept last night. A blanket of warmth and hope and love and prayer. And I have no words to tell you what that meant. Sometime today, I will hear from the doctor. And whatever it is that he has to say, I know that we can face. And I know that we won’t face it alone. I wrote the following in April of 2011. I thought it apt to share again today. “She is a friend of my mind. She gather me, man. The pieces I am, she gather them and give them back to me in all the right order. It’s good, you know, when you got a woman who is a friend of your mind.” ~ from Toni Morrison’s Beloved, sent to me in just the right moment by my friend, Jeneil. Love you, girl. Last year, when our family was going through a particularly trying (and frightening) time, my dear, amazing friend April had some advice. Perhaps advice isn’t the right word. It was more like a directive. Or I suppose if I wanted to soften it a little I could call it a plea. You see, while April picks her spots, when she has insight that she feels the need to share, she gets delightfully bossy. At any rate, she implored me to share what we were going through with our mutual friends. I can’t remember her exact words, but it went something like this. Offer it up and offer it out. Your friends love you. Let them know. Lighten the load by letting them carry some of it. If nothing else, let them hold you in prayer. You don’t have to walk through this alone. April’s words changed me. It took me months to let them truly sink in, but once they did, they changed me. I never did make an announcement to that particular circle of friends, but I did share what we were going through with people in my life. I asked for help. 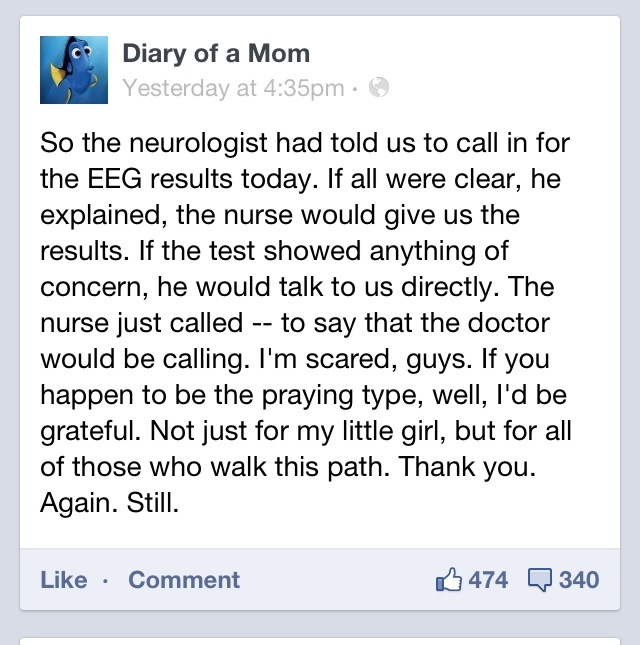 (Which was kinda big for the kid whose first words were, “I do it myself.”) I even asked some close friends to pray. It felt odd. And wonderful. And empowering. This journey, as rewarding as it may be, is hard. It’s damned hard. While it can bring out the best in people, it also has an uncanny knack for shining a harsh light on the worst of humanity’s failings. At points it is desperately frustrating. It is disheartening. And it’s BIG. Sometimes it’s so big that for the life of us, we don’t know where to start. Sometimes it feels like there’s nothing we can do but scream into the wind, shake a fist at the sky, and then hide under the covers until it all starts again in the morning. And it’s in those moments that I think of April. Offer it up and offer it out. Your friends love you. Let them know. Lighten the load by letting them carry some of it. If nothing else, let them hold you in prayer. You don’t have to walk through this alone. Your friends may be down the block or they may be half-way around the world. They may be people you interact with every day or they may be people you’ve never met. They may be right here. I know right now that’s exactly what you’re doing. Yes, Jess, we’re all here for you! Love Toni Morrison and love Jeneil. Wise wise words. I just know it will all be ok. I have such a strong feeling about your girl. It may be a bump in the road but that road keeps on going!!! Hang on for the ride! You have such love behind you all. Never ever alone. Here always when you need us and want us. For your whole family. You are not alone! Every morning hundreds of us- maybe thousands!- wait for your words. You are brave, funny, and smart. You make us laugh, almost always make us cry, and fill us with hope. For all that you have given us, we are grateful. You have created a community here- an amazing one- and we are sending love your way! We want you to know that you are in our thoughts- you, Katie, Brooke, and Luau. Hang in there. Whatever is going on, I hope you get some answers soon, and some way of helping. You totally rock, and I love you and your family. You guys have let me know we are not alone in where we are with so many things! We’re here. And we are sending lots of hugs, the kinds you all like best. We are here, you are not alone. We are with you at your desk, at the hospital and in the hallways. We wait with you, as you sit waiting for the phone to ring, or someone to come into the room with you information you are looking for. We laugh, cry, vent, and rally against the world at your side. You are never alone, even when the world seems darkest, look for us we will be there. When we help each other, we also help ourselves. Offering it up and out allows others to not only be brave and do so themselves, but to realize that they are a part of the community. Whatever comes, we will all be there for your family and we will all help to weave the threads of reality. We hold you hand until you get the phone call today from the doctor. We sit next to you when you talk to the physician, and we walk with you….we take each step beside you…..whatever the news….we hold you…..never alone….never…..sending prayers of comfort and peace as you wait. I love you and your babies. I’m hoping for reassuring news, soon. The most comforting thing about the online community is knowing that we are never alone. Hope today brings some answers…and some hope. Whatever the doctor has to say, you can, and will be strong enough. It may be nothing. It may be something you can change, or it may be something you can’t change. At any rate, you, your family, your daughter, will be strong enough. Love and prayers from Kansas. Good Thoughts… Prayers and Blessings for you this day. I hope the doctor calls soon and that there is no bad news, just as someone else wrote, more information. My thoughts are with you and I’m holding on tight to my little thread in this net of love and support that surrounds you and your family. Hoping you hear soon…and it is good news. We are all holding your hand as long as you need us!! You (we) are never alone!! Count me among the many sending positive thoughts your way today. First thing I thought today, not last night, was that the dr. knows you well enough that he wanted to speak with you personally no matter what. I don’t know if that is the case here but, hopefully, it is. Praying again, dear Jess. Praying for you. Hating that you are now going through this that is all too familiar. Hugs. Just saw your update on Facebook. So sorry. Sending you and your family all our love and support.